First time parenting can be scary enough, and Lisa-Jo Baker had every reason to NOT want to be a mom. Every aspect of her life fought the very idea of giving birth, even to the spiritual lies that shaped that desire. With every thing that made me want to be a mom my whole life, Lisa-Jo experienced to shape her heart to NOT be one. 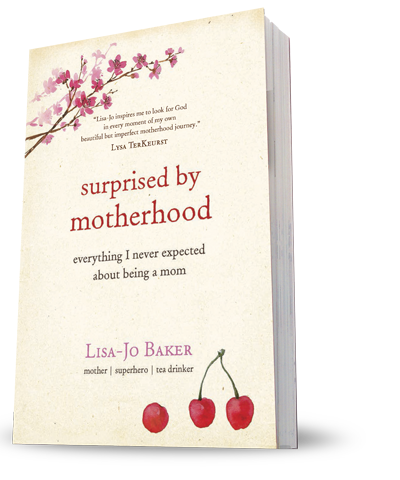 When I received my copy of Lisa-Jo Baker's book, surprised by motherhood, I could hardly wait to read it. I didn't think it would have anything to do with me... well, she is a tad younger than I, and didn't want to be a mom... and is in the midst of raising 3 littles. I didn't think there was anything in there for me to relate to... I'm older, and an empty-nester, and couldn't wait to be a mom my whole life...could we be more polar opposite? But I WANTED to read it - simply because Lisa-Jo is a rock star and fearless leader in the (in)courage community and a co-worker with DaySpring. I was floored when I read the first 3 chapters online, and couldn't wait to read the rest of it! Since then, I've read, re-read, and had to refrain from marking it all up with things I want to tweet! I've laughed out loud (cackled even! ), cried (sobbed), and couldn't put it down. I can't think of anyone that wouldn't enjoy this book! Although you can read (and re-read) Lisa-Jo's blog, and learn about her life online, this book is so much more. If the blog is her skin, then this book is her heart and soul. I've come to love this woman! Her story is so very different than my own, yet I resonate with her words of home-sickness, of wanting to fix what's wrong in the world, of doubting her parenting skills, and mostly, of faith. It's so much more than a book on motherhood; more than what changed her mind to become one in the first place. It's the life story of a modern day woman who loves God more than anything, and how she really learns of His great love for her. This book reads as entertaining as a best-selling novel - but it's all true to life. It makes it so much better knowing how this is her HIStory; the life God created her for. Just as she fearlessly leads the (in)courage community to stand up and write down our own story, she is real, and genuine, and tearfully shares the dusty road God has walked her along from South Africa to Virginia. I can think of 100 people who should read this book; men and women, every genre of person out there. Her heart beats so strongly in it, her words crafted so well (and yes, I admit, I had to look up a few - mostly referring to her South African terms).